We are always delighted to receive written testimonials from satisfied customers whom we have provided building services or preservation work such as damp proofing, dry rot, wet rot or similar. Just like to say how pleased I am with the way the job was handled from start to finish. I would especially like to thank the 2 tradesmen that worked on the house - couldn’t have done better. Thank you very much for sending such a fab plsterer to repair my chimney this Monday and Tuesday. The chaps who came were polite and on time, and the man who came first of all was neat and methodical. The plasterer worked so swiftly, the finsh, although still drying, feels like glass - it's amazing! I have been singing your praises, for honouring my guarantee and repair the damp in my chimney again. Thank you for the work carried out on Monday - the job was carried out quickly and professionally and I am very pleased. Barry came soon after I emailed and was very skilled and good at explaining to me and the ladies in the other two flats about the damp/condensation problems. I really valued his visit and look forward to his report with interest. He was a pleasure to have advising us in this block of flats. I just want to say that the work carried out today by Tony on the damp problem in the main bedroom of my flat was excellent. I can't praise him enough, also my thanks to the backup Richard when he arrived, they were a good team. The standard of work was above par, there is not a mark on my wallpaper, and when 'Henry' was used at the end to clear the dust for me, it was the icing on the cake! I shall recommend Croft without hesitation to anyone, and as one of the directors of our management company, will suggest contacting you, should we have a problem. I found your employees pleasant and friendly and their work excellent. The garage is now a very useful addition to the property. Thank you to all your team for the work completed on my house. 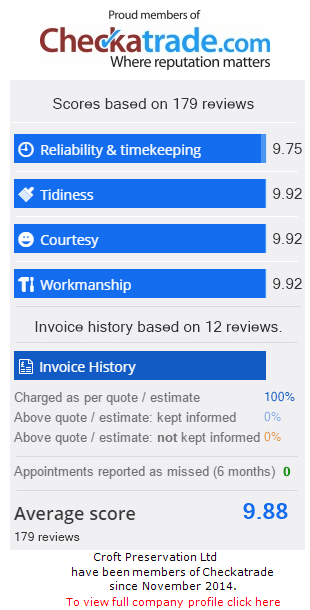 I would be happy to recommend your company and would definitely use your services again. We'd like to say that we're really pleased with everything that's been done at 44. The men have been willing, friendly, but respectful too. A few are like familyand I shall miss the fun and the banter that we've had. The wall is much admired and is the jewel in the crown. We would like to take this opportunity to thank you for your prompt service and the open manner of your advice regarding our damp problem. Alex and Jason carried out the job in a friendly, efficient manner and most importantly left the site cleaner than they found it! Thanks to the both of them and indeed to you all. Thank you for the work you have done on the above property. I am delighted to have it done at last. Please convey my thanks to Tony and Russel. I am sorry they had to leave sooner than I expected on the Friday to thank them in person. Thank you Dan for your part in the proceedings, both before and after the work. I appreciate the fuller summery of the work done. I look forward to receiving the 20 Year Guarantee which hopefully will also outline the work undertaken and completed by Croft Preservation. May I also take this opportunity to thank Croft for the prompt service provided from the outset by carrying out the initial survey/assessment, producing the report and completing the subsequent work in a timely manner. In particular, please pass on my thanks to Lydia and Alison who were always punctual in responding to our telephone calls and emails and to Alec and Jason for their hard work in carrying out to the job to our complete satisfaction. I would not hesitate to recommend Croft to family and friends in the future. We recommend Dan Trickett and Croft’s for the efficient way in which they have extended, refurbished and decorated our bungalow. They have worked with exceeding courtesy, good humour and professionalism. We have had extensive alternations and refurbishment to the property, including lighting, electricity and plumbing and we have been very pleased with the consistently high quality of workmanship provided by Dan and his employees throughout the build. We have found Dan and all the Croft employees to be very dedicated, they have met tight deadlines and completed the work to a high standard. They can be thoroughly trusted and relied upon. They have also been prepared to modify the build as needed. They have had a difficult time, fitting in with the delays caused by another company who are fitting the kitchen, because of their on-going contracts, but have nevertheless done their utmost to accommodate us. We have reservations in recommending them and will certainly be prepared to consider them for further work for ourselves should the need arise. I am grateful you were able to carry out the work at such short notice. Dan Trickett did an excellent job and solved a problem that could have prevailed me from buying property. It’s nice to know there are still people who can turn up on time and do a decent job. I am very pleased with the outcome and would not hesitate to recommend you to others. A big thank you to all involved. We are very pleased with the work that you have done for us, we were also pleased with the work site when you had finished. Thank you very much from all of us for all your efforts in organising, often at very short notice. We do appreciate it enabling us to achieve the student start date of 3rd of September. May we take the opportunity to thank you and your team for your help and professionalism. We are very happy with the work and so pleased that we can now move ahead with creating a nice home for ourselves and our family. Thank you very much for the high quality damp-proofing job that your company did on our basement flat. Quite a transformation! We are very pleased with both the work done and the courtesy of the staff involved. We look forward to receiving the guarantees at your earliest convenience. I wish to express my thanks for the work conducted that has already improved the quality of the property. It would be appreciated if you could pass on my thanks to those who completed the work. With the completion of the work and the enclosed payments, I shall be pleased to receive in due course your guarantee in respect of these works. Thank you for standing by your original quotation of last year. I would like to add that I am very satisfied with the work and to thank you for the way in which it was carried out. I would like to buy you all a drink. We’d like to take this opportunity to thank all of you at Croft for the work carried out. We are very happy with the finished product and will happily recommend your company to anyone who asks. Please pass on our thanks to all of your sub-contractors who have helped on the project. May I say what a pleasure it was to have had your company do the work us. I was most impressed by the speed, the state they left the house in and the extremely nice gentlemen who certified out the work. I have already recommended you to a friend – who has already been in touch with you. Thank you so much for all the work you have done. A huge thank you again for a professional job by a great team. Here’s to a damp-free Winter at my new property. I would like to say how pleased we are the finished job, I must admit that when I visited the house and saw the initial work and the mess involved, I had a few concerns but the end result is finished to a high standard and the house was left very tidy. We look forward to recovering the Guarantee so this can be passed to our purchaser's Solicitors. Thank you for the time yesterday. I’d just like feedback that your surveyor was very courteous, friendly and explained everything really well giving an air of expertise that was refreshing when compared to the other companies we have had round to assess the damp.